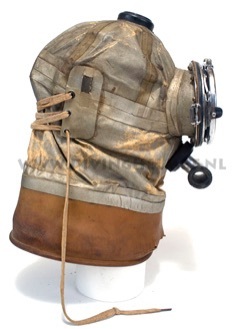 My friend told me that he was sent down into the hold of the ship to look for loose stuff which could be removed, and among the rubble down there he found an old under water camera housing from Cousteau and 2 triple tank sets from the nineteen forties. After having dragged it all up on deck he asked the officer what he should do with it and was answered that he should take it to the scrap heap just like the rest of what came off the ship. He took off with the ‘scrap’ but instead of dumping it with at the scrap-heap he dropped it carefully into the trunk of his own car to take it home. One triple tank set he had given away to a friend so what he showed me in that basement was one triple tank set and the Cousteau camera housing. He told me that the housing was probably used for making the film ‘Par 18 metres de fond’ and he asked me if I was interested in it ... which I obviously was(!) We worked out an exchange with some hard hat equipment for his collection. 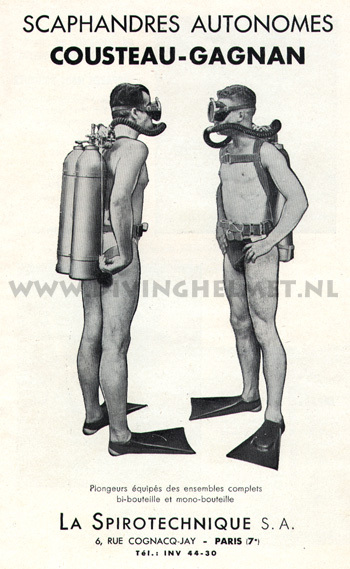 When Jacques Cousteau and Emil Gagnan conquered the world with their SCUBA equipment they did not only start up a revolution which would become known as ‘sports-diving’, they also entered the market with a diving apparatus which was ‘cheap’ compared to the price of the classic diving equipment with a heavy helmet and air-pump. 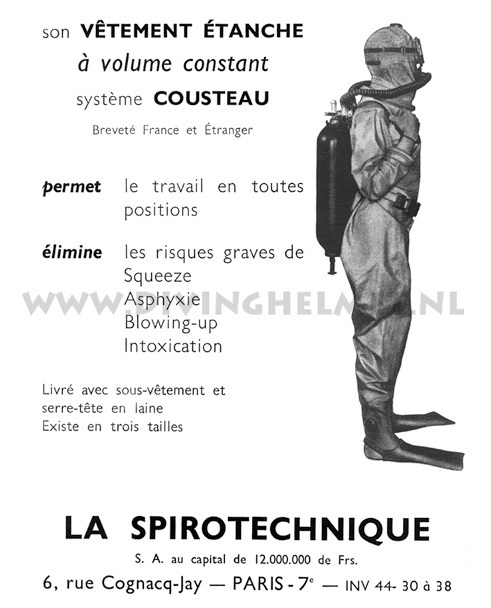 La Spirotechnique developed a version for professional diving where the diver is wearing a ‘constant-volume’ suit ( a dry suit with a hood attached to it ) with the Cousteau-Gagnan regulator strapped at his back and the air supplied from the surface by an air-compressor and/or buffer tank. 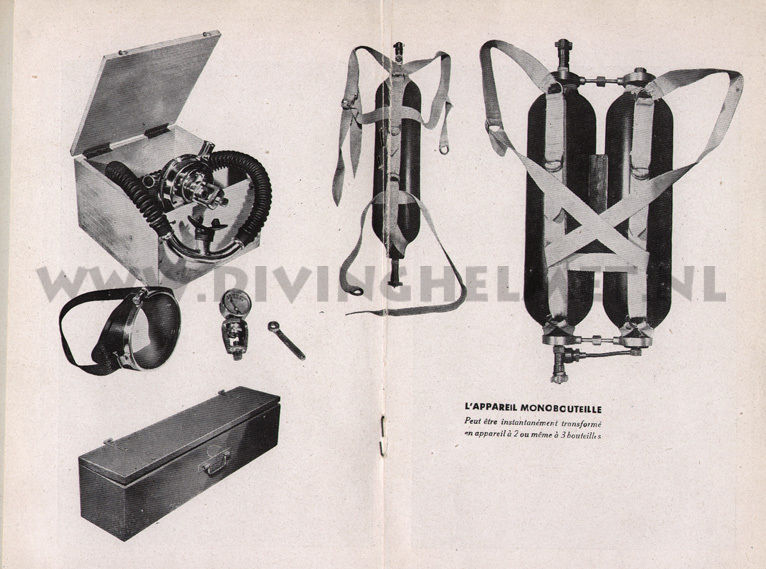 This equipment was called the ‘Vetement Phoque’ and ‘Detendeur Narghile’ and provided a perfect equipment to compete with the old style heavy dress. 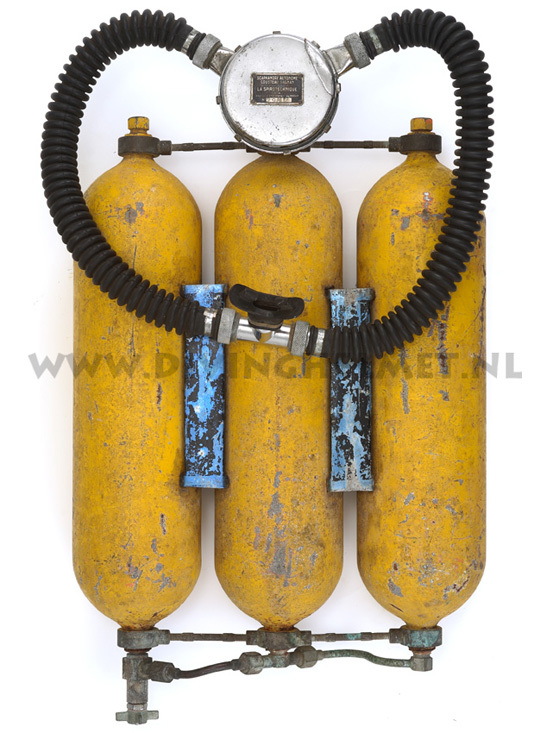 And due to the price anybody could afford it and perform underwater work at competitive prices. 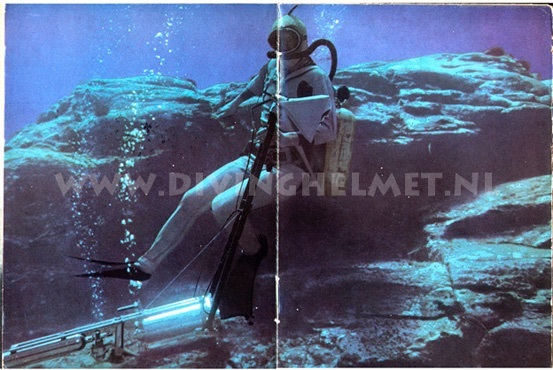 In the nineteen fifties several manufacturers of the classic equipment like Draeger, Heinke, Piel and Siebe Gorman started to develop lightweight helmets and/or SCUBA equipment which was more or less copied from the constant volume suits and regulators from Cousteau and Gagnan. 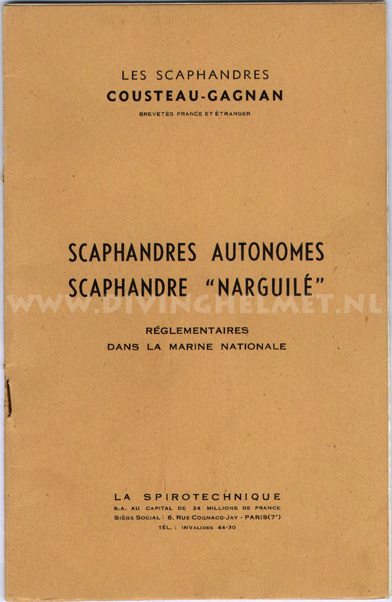 An advertisement from the diving manual ‘La Plongée en Scaphandre’ written by Tailliez, Dumas, Cousteau, Alinat and Dr Devilla and published by Editions Elzevir in 1950. 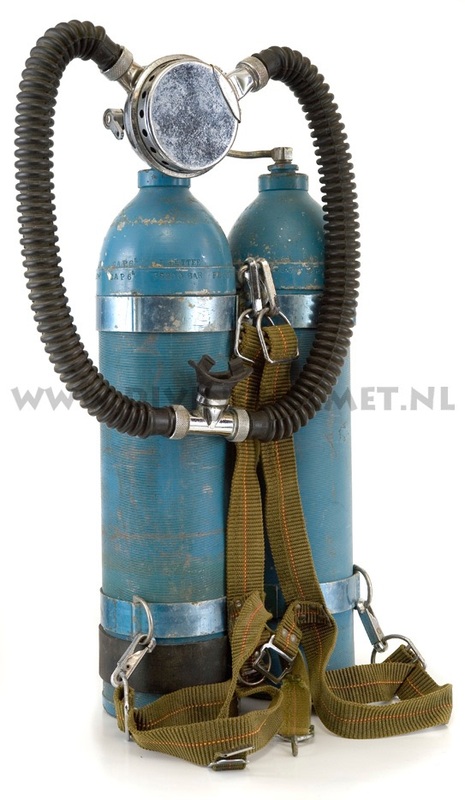 It shows the second version of the ‘Vetement Phoque’ and a ‘La Spirotechnique’ SCUBA tank of the second version (anodized dark bleu) with a CG45 regulator. 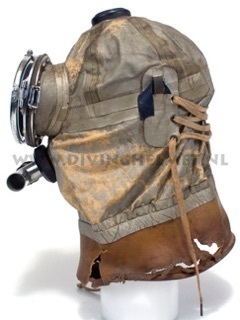 The first style suit had cords to pull the mask on the divers face, the version in the advertisement is the second style which has rubber straps to tighten the mask to the divers face. 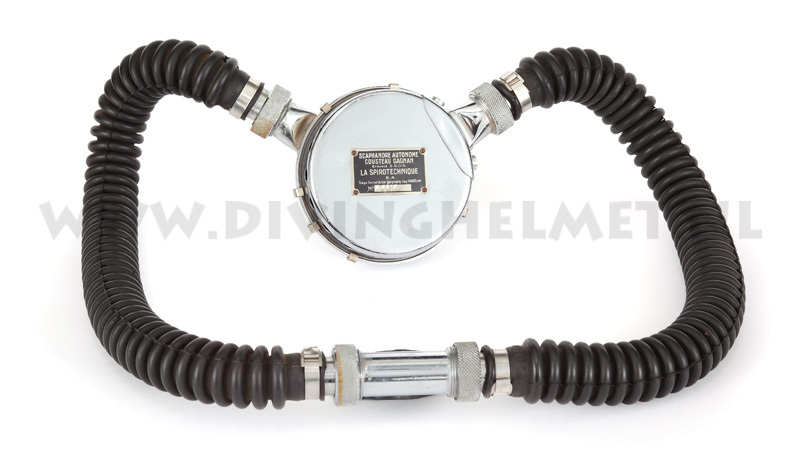 The ‘Bi-Alu’, the SCUBA tank made for the recreational and professional diver, the bleu anodized version of 1947. 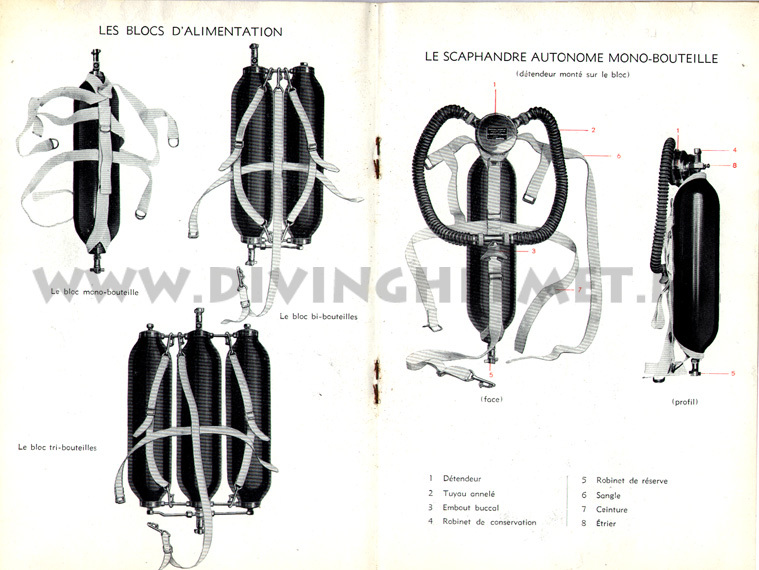 An illustration of a complete diver with the new style ‘Bi-Alu’ tank with CG45 regulator as illustrated in the fourth edition of the CG45 diving manual of 1950 - 1955. 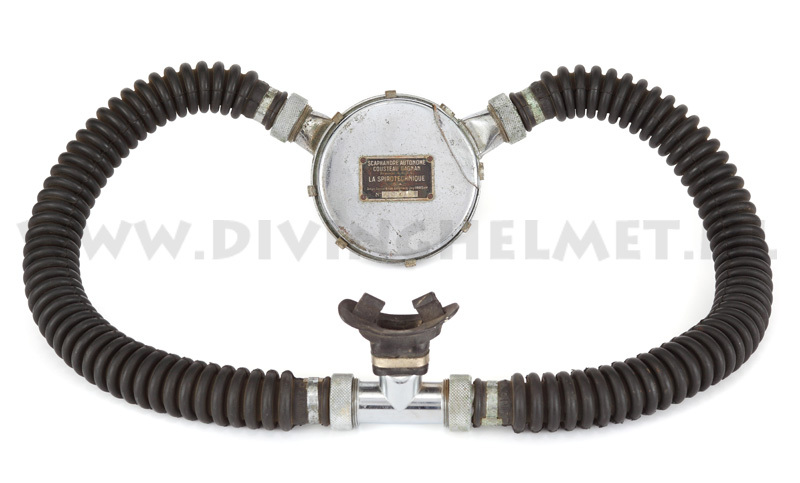 The harness is an earlier version then the harness at the twin set shown at the photo above. 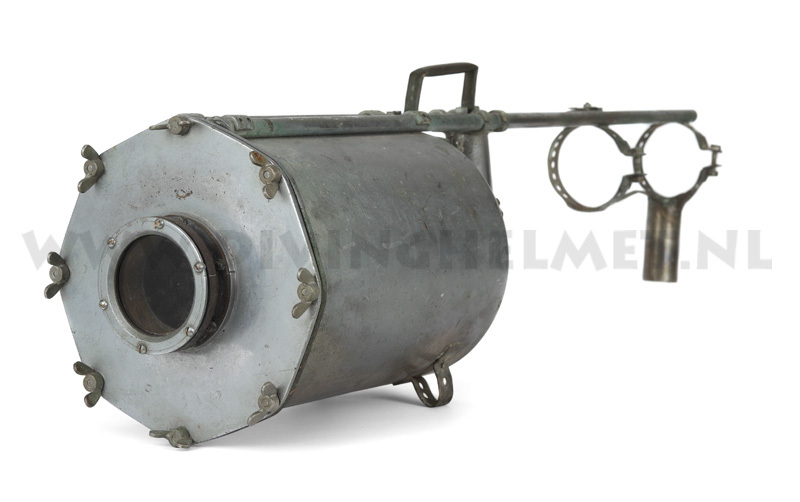 The Camera housing was hand made for Jacques Y.Cousteau at the military navy base ‘Arsenal de Toulon’ In the loops at the back end a tank with compressed air was clamped which was connected to the housing. 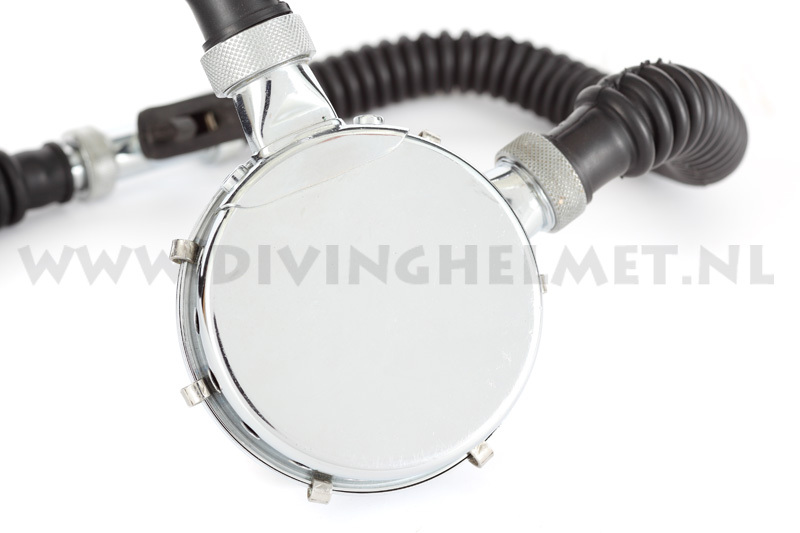 When taking it under water the valve at the tank was opened to provide a steady flow of air into the camera housing. 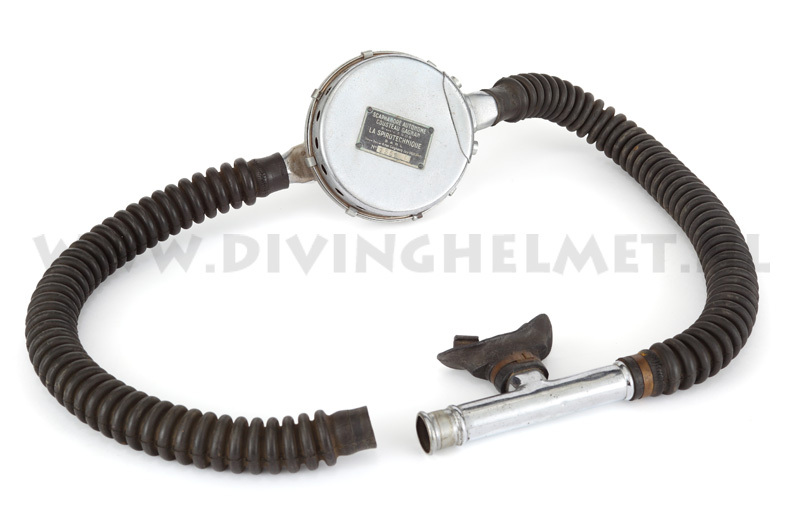 At the back there is a spring operated exhaust-valve like on a divers helmet to allow the air to escape when it exceeds a certain pressure. The idea is that because of the pressure inside the housing no water would be pressed into it when taking deeper under water. Photographs David L.Dekker. 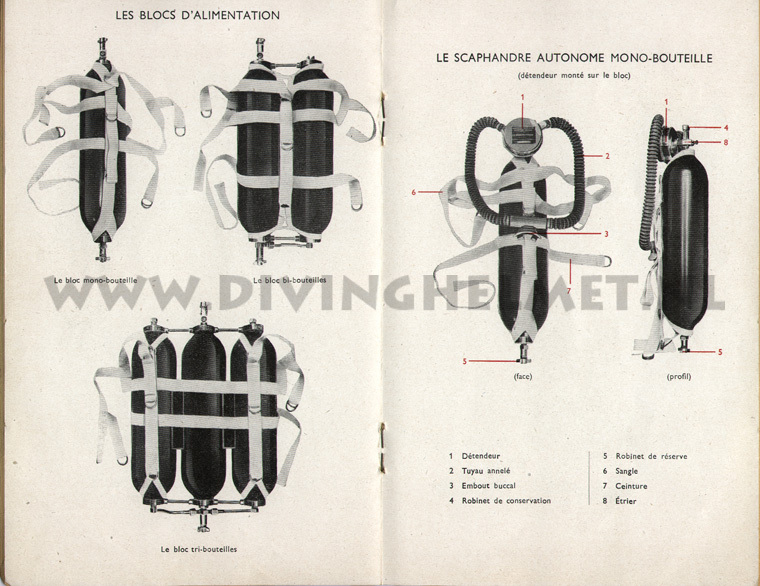 The scan above comes from the 1955 french navy diving manual ‘INSTRUCTION sur la PLONGEE EN SCAPHANDRE A L’AIR’ The name ‘reserve en bas’ ( reserve down ) is explained in the drawing on the left: the reserve in the valve on top of the tank is operated from the knob at the bottom of the tank. 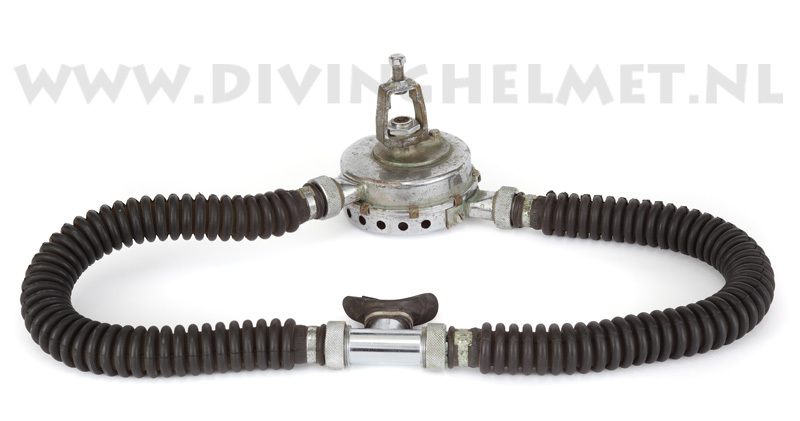 It is attached to a rod which goes all through the tank to the valve on the top side. 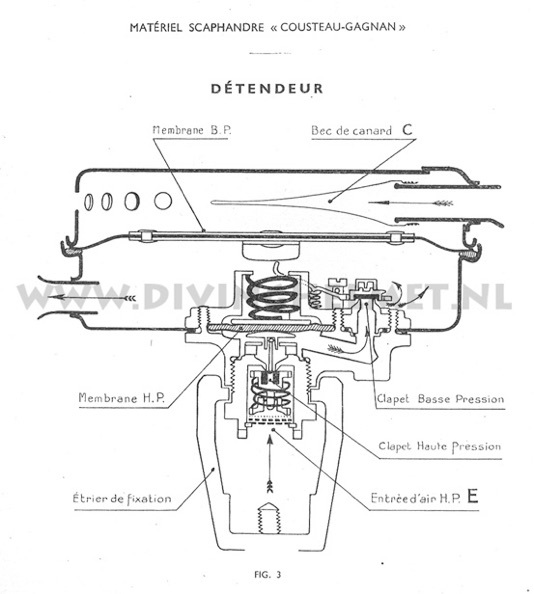 The ‘reserve en bas’ tanks are being referred to as the ‘ANCIEN MODELE’ ( old model ) The valve at the right in the illustration shows the ‘new model’ with a reserve mechanism operated by a pull rod. 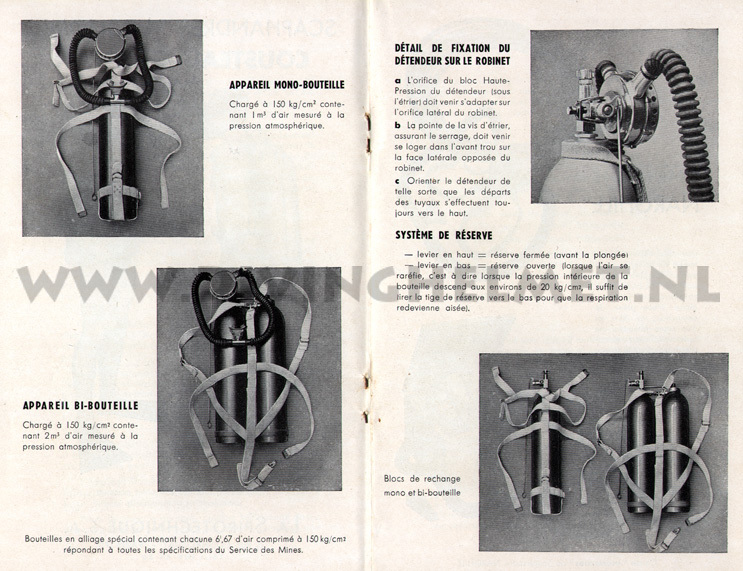 The CG45 ( Cousteau Gagnan 1945 ) regulator can be compared with the regulator from Benoit Rouquayrol ( see chapter 1860 Rouquayrol Denayrouze ) The only difference is that the actual valve is of a different design due to the higher pressure which is used. 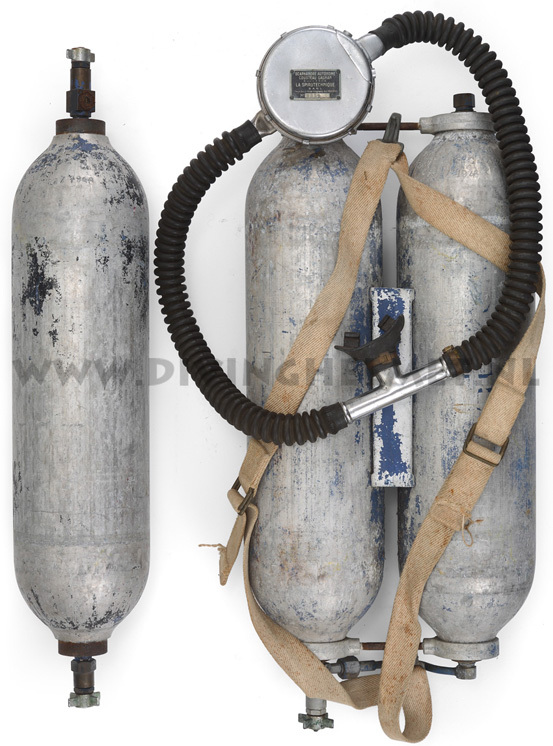 But the main system is identical: it also is a tank with air with an air-chamber on top of it, with a valve between the tank and the air-chamber. 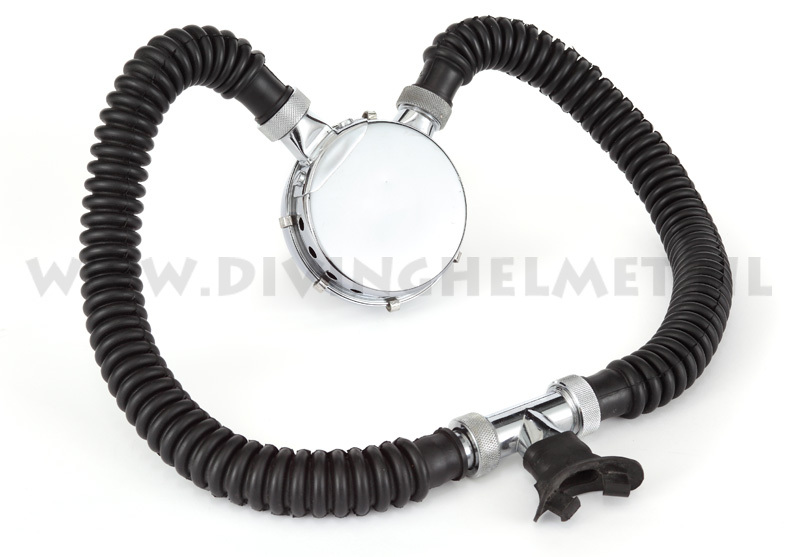 And when the diver demands air ( inhales ) a rubber diafragm descends and this opens the valve. 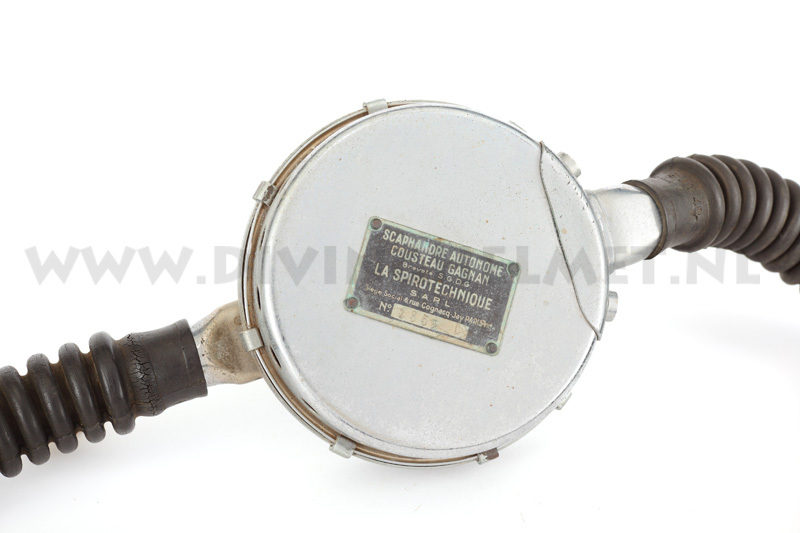 Also the ‘bec de canard’ ( duck valve ) is still used as the exhaust-valve in the system. 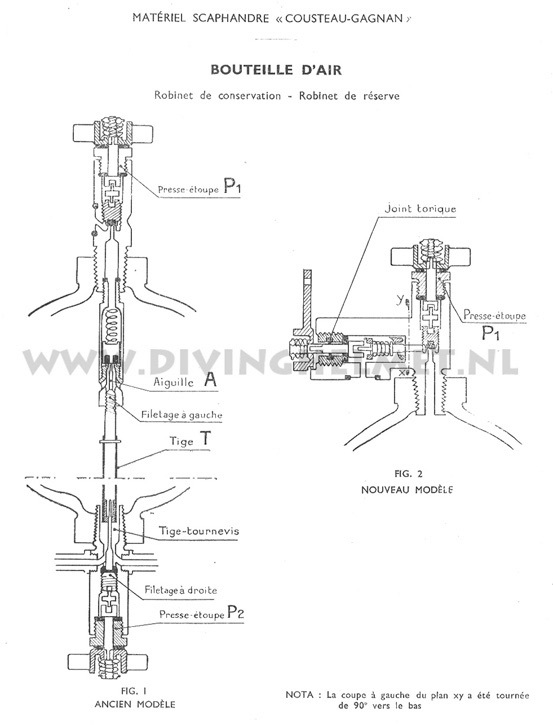 The Cousteau Gagnan regulator is almost entirely based on the technique of the Rouquayrol regulator. PS: The tank set shown here above originally was supplied to the military with a CG45 regulator that had a much larger badge on it. This ‘large badge CG45’ I have not been able to find: do you have or know one for sale then pls. let me know. 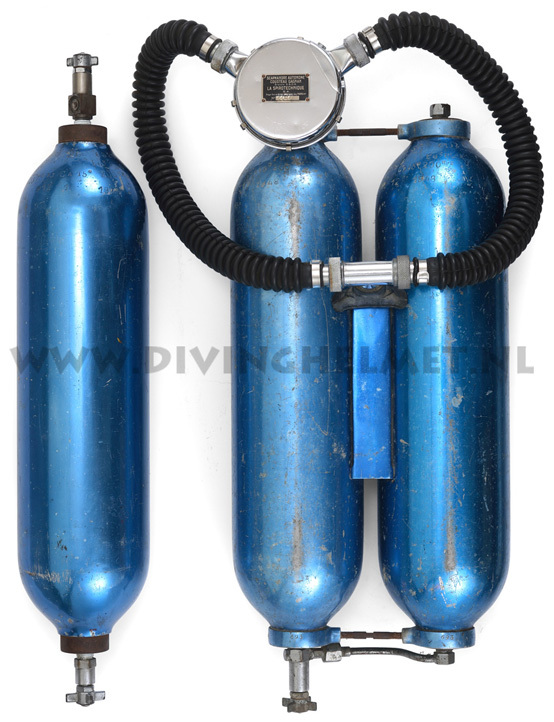 The photo above shows the second style single and twin aluminium Spirotechnique tanks which were no longer painted but anodized in bleu. 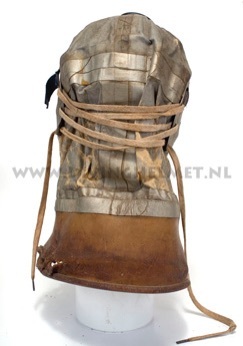 It is also the last style of tanks with ‘reserve en bas’. 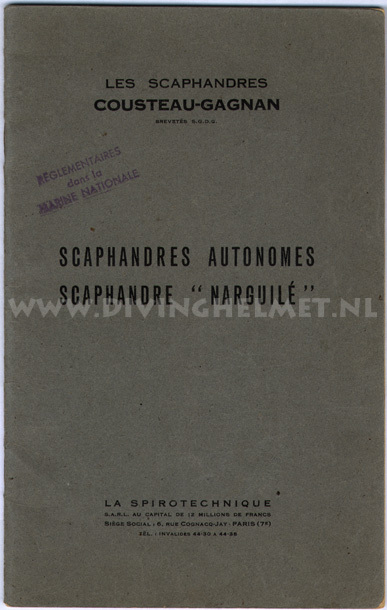 The single tank is dated 1947 and I found it in Holland. 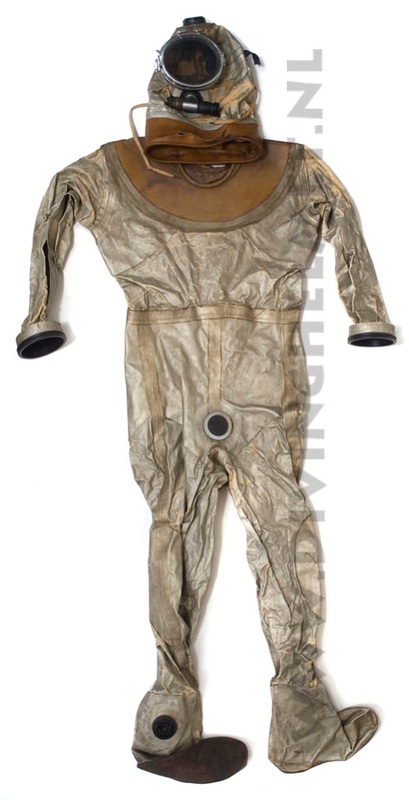 The twin set I found in France and it is dated 1949. 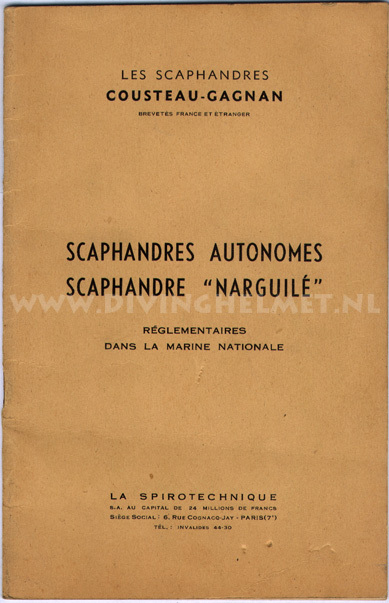 La Spirotechnique stopped making tanks with the ‘reserve en bas’ in 1950. 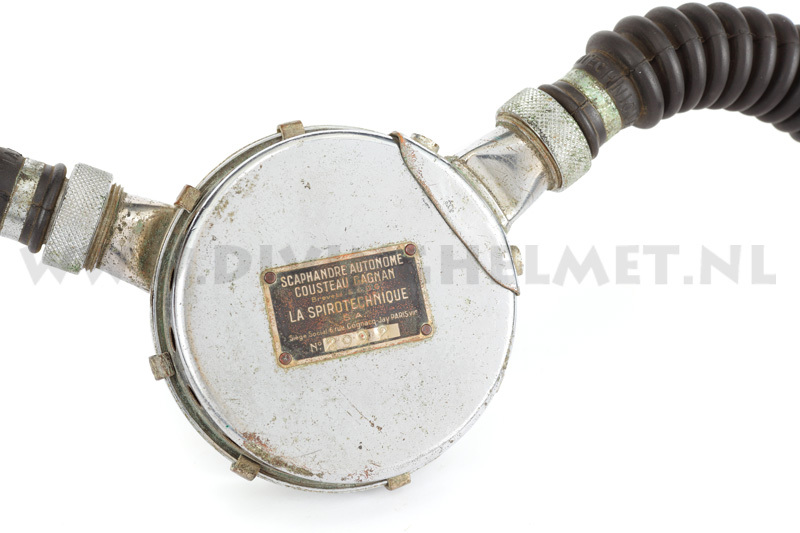 The regulator is the later style CG45 because the company name is followed by SA ( Société Anonyme ) Photograph David L.Dekker. 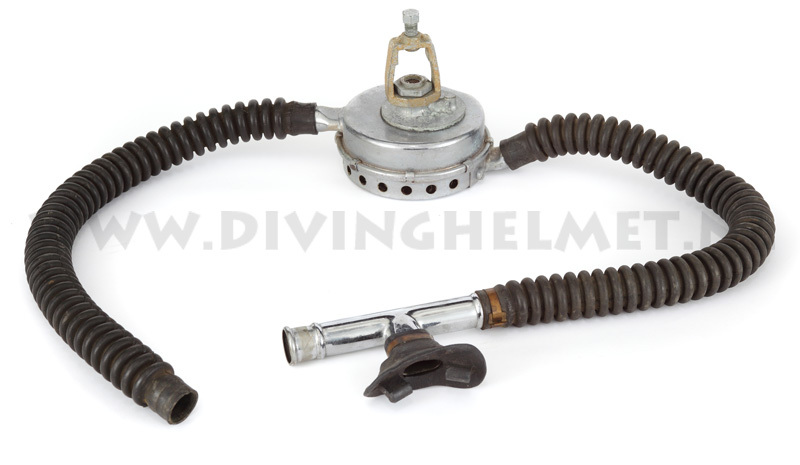 The photo above shows a younger lightweight version of the‘Bi-Alu’ twin tank set which was made of aluminium but enforced by a steel wire which was wound around the tank. The tanks are dated early nineteen sixties. 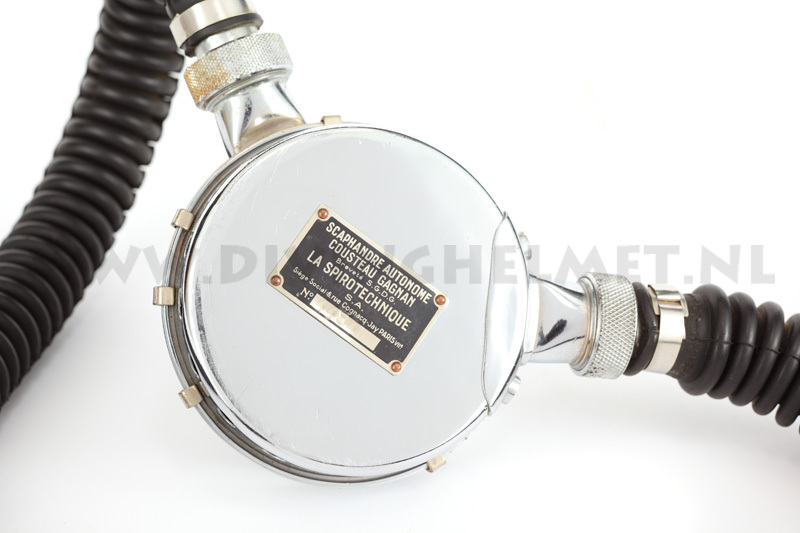 The regulator which is mounted on it is the La Spirotechnique ‘CG45’ regulator without a company badge. Why there are CG45’s around without a company badge is a bit of a mystery, when anybody knows why then please let me know. 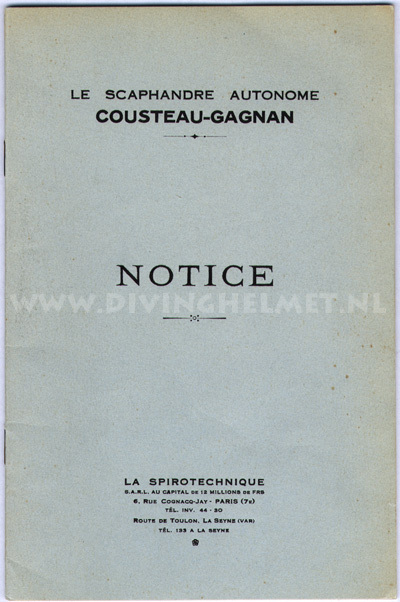 The CG45 without a company badge is also shown in the fourth edition of the CG45 Diving Manual of 1950 - 1955 ( shown below ) The CG45 was officially used by the government services into the nineteen seventies and then all got destroyed, as a result nowadays it is one of the rarest regulators. The twin tanks here above I bought on a flea market in France from an old man who had taken them home as a souvenir when he left the military diving school of St Mandriez in the nineteen sixties. Photograph David L.Dekker.